The same research team that appealed to anti-fracking activists Josh Fox, Mark Ruffalo and Yoko Ono after their work was rejected by the National Institutes of Health for not being “good enough to be funded” has just published a new study proclaiming that exposure to endocrine disrupting chemicals (EDCs) in fracking fluid causes low sperm count in mice. While the researchers were not able to secure funding from the National Institutes of Health, they did receive a grant from the Passport Foundation, which also provides funding to anti-fracking groups such as the NRDC, EarthJustice, and the Environmental Working Group. As EID pointed out in a recent report, the Passport Foundation is part of the Health and Environmental Funders Network (HEFN), which was also behind number of “reports” (many of which were written and peer reviewed by anti-fracking activists) that were used to justify the ban on fracking in New York. The researchers created a cocktail of 24 chemicals that, if consumed in very large doses, are known to cause health problems. They then injected this cocktail – in very large doses – into the water of pregnant mice and declared that it caused the baby male mice to have low sperm counts. No wonder the National Institutes of Health wouldn’t fund this study! Even though they admit to subjecting the mice to extreme doses, far higher than what would ever plausible, they make the head-scratching claim that because they also subjected them to doses in the range of 3-30 g/kg/d that means they used doses that were at appropriate levels! Further it’s well known that fracking fluid is typically 99.5 percent water and sand, while the remaining 0.5 percent is made up of additives. According to that same EPA report, the maximum concentration of all additives was less than one percent and the median maximum fracking fluid concentration was 0.43 percent by mass. 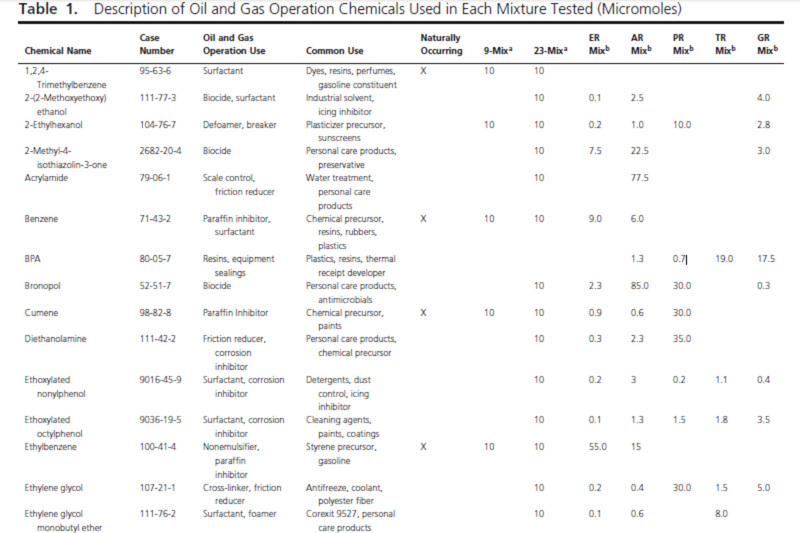 In other words, the researchers exposed mice to 24 chemicals even though the median number is 14 for any given fracking operation – and they did so at extremely high concentrations even though they admit that wastewater would never have levels even remotely that high. “Both naturally occurring chemicals and synthetic chemicals from other sources could contribute to the activity observed in the water samples collected in this study” (p. 16, emphasis added). It’s also worth noting that six of these chemicals are also surfactants – chemicals what were recently found to be “no more toxic than common household substances” by a University of Colorado-Boulder report. The bottom line is that in order for a chemical to be of concern for toxicity there needs to be a concentration high enough to cause harm and a pathway for contamination. With chemicals making up less than percent of the fracking fluid, and even EPA stating that there’s no credible threat to drinking water from fracking, it’s more likely that exposure to these chemicals is greater in your kitchen or garage.